Black and Gold PVD coated Titanium (6AL-4V) belly bars and bananabells. The PVD process provides a Hypoalergenic coating over the Titanium giving the ultimate protection for those who suffer from metal alergies. 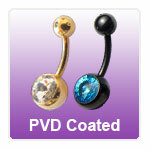 Gold PVD Belly Bars and Black PVD Belly Bars. This section contains standard plain and jewelled PVD belly bars in black and gold finish but also a range of PVD coated Titanium Belly twisters and body spirals.